Wikipedia is something of a modern day miracle. It’s a free, perpetually up-to-date, nigh-all-inclusive, readily accessible encyclopedia that has long proven to be about as accurate as more traditional alternatives. 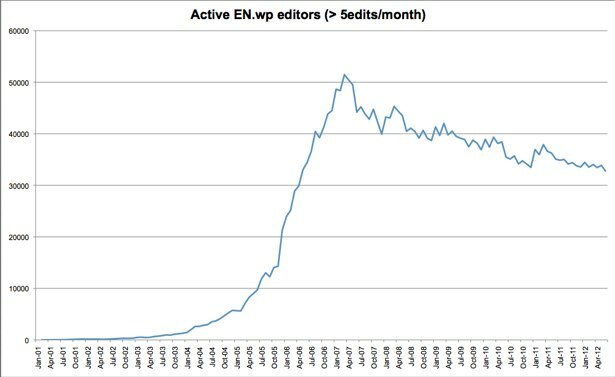 The easy thing to forget, however, is that this is only because an army of Wikipedians is dutifully editing, re-editing, and re-re-editing the site’s myriad pages. 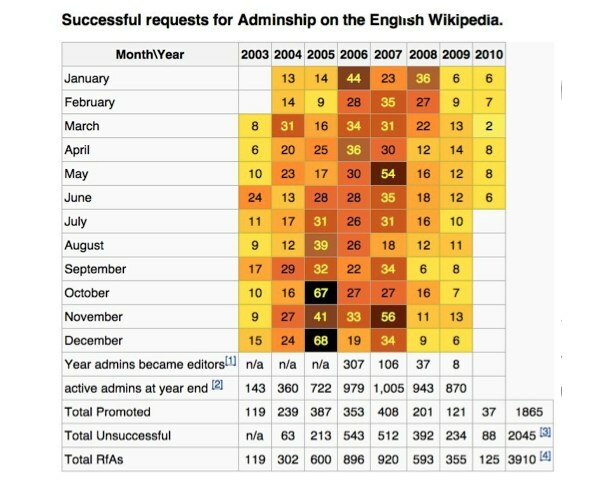 Unfortunately, there seems to be a downward trend; the number of new Wikipedia Admins has dropped off, and if the pattern continues, the site could face a very serious shortage. Before really digging in, it’s worth making a semantic distinction here. Anyone can edit Wikipedia, so anyone can be an editor. Admins, or sysops, on the other hand are a great deal rarer. Admins are nominated and promoted from the general Wikipedia populous through an application process and, if they pass, they become the site’s curators and custodians, gaining the power to block editors, delete posts, and protect pages by blocking them for editing. You know, all the powers a troll would really love to have. 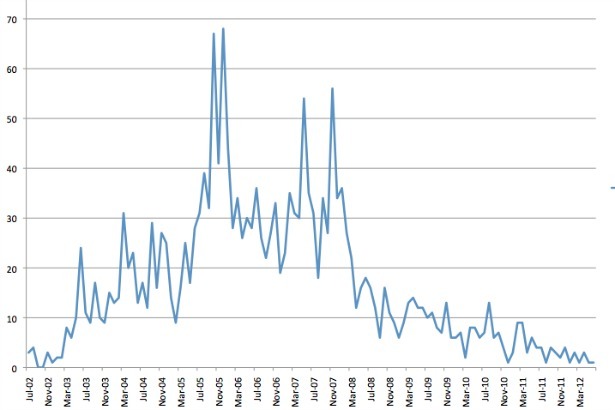 As shown in this chart from The Atlantic, the number of approved admins has been steadily dropping year to year. Obviously promotion to Admin-ship is kind of an honor, but the number of people who are earning that honor is dropping off at a surprising rate. Numbers-wise, the site peaked at 2007 promoting 408 people to Admins that year, and closing out with a total of 1,005. By 2009, the total number of Admins at year-end had dropped to 870, but more troublingly, a mere newbies 37 were successfully promoted. Now, as you can see above, the flow of fresh blood has slowed to a veritable trickle; there haven’t been more than 10 promotions in a single month since 2010, compaired to monthly totals in the 60s back in 2005. You can see how this might be a problem. In the past, getting an admin position consisted mainly of not being an idiot or some kind of poorly disguised troll, hankering to some some large-scale vandalism. Now, that the process is getting more and more involved, fewer and fewer people make it through. Combine that with the shrinking editor-base and you’ve got a problem. All that said, Wikipedia is far from dire straights. For one thing, there are still many extremely devoted Admins and editors out there right now. Justin Knapp just reached his millionth edit, for instance. Wikipedia is also going to be rolling out the beta of a new, hopefully more inviting, text editor that might help bring in newbies who may, someday, set their sights on Admin-ship, and maybe some ladies to help even out the site’s gender-skew. Here’s to hoping; I don’t think any of us want to see Wikipedia go the way of Microsoft Encarta.